Over-filtering can obliterate the beauty of your photos or make them look cliché. So to give you more nuanced control, Twitter for iOS and Android today replaced its clumsy photo filter grid with a much simpler Instagram-style row of adjustable filters. Each filter can be double-tapped to reveal an intensity slider so you can lay that sepia effect on heavy or light to get the perfect hipster sheen. Twitter first launched photo filters back in 2012 after Instagram made them a fad. But the design for choosing between filters was squint-inducing. Twitter divided the screen into nine tiny thumbnails showing how your photo would look with the different filters. You had to know to tap to enlarge one and then swipe sideways to easily compare the full-screen versions. Twitter’s new filtering system will roll out to all iOS and Android users today. Twitter offers a row of filters that you can easily tap through to pick the best one. It should be familiar, considering it’s basically a clone of Instagram’s filter selector. You can choose from Radiant, Positive, Warm, Breeze, Glow, Golden, Fame and Stark. With the adjustable power slider revealed by a double tap, you can increase or decrease the intensity of the filter. Good design is good design. Great artists steal. If it ain’t broke, don’t fix it. Still, the similarity between Twitter’s new design and Instagram’s is uncanny. Really, it’s just the latest in a continuing social singularity as Facebook and Twitter copy each other ad nauseam. Facebook launches hashtags and trending topics while Twitter experiments with a News Feed-style filtered feed. Copying isn’t inherently bad, it’s just not very inspiring. 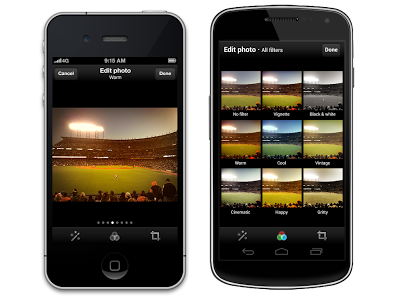 Instagram’s classic photo filters on the left, Twitter’s new filters on the right. The similarity is unmistakable. Photo sharing has become a hotly contested space since they’re so irresistible that they generate out-sized engagement compared to text on services like Facebook and Twitter. If Twitter’s new filter interface can attract more photographers, it will also have a better chance of turning their audiences into loyal users.